The Warrior Mens Evolution Lacrosse Game Shorts from Alleson Athletics is a full collegiate cut short. Stretch mesh solid body with contrast color side inserts. Double thickness body with moisture management tricot knit liner. Four piece mock woven side inserts with contrast color inserts to match main jersey. 1.5" covered elastic waistband with inside drawcord. 9" inseam. 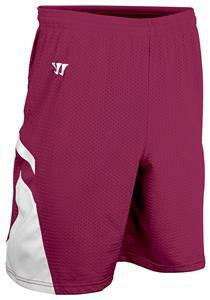 The Warrior Evolution Lacrosse Game Shorts from Alleson Athletics is a full collegiate cut short. Stretch mesh solid body with contrast color side inserts. Double thickness body with moisture management tricot knit liner. Four piece mock woven side inserts with contrast color inserts to match main jersey. 1.5" covered elastic waistband with inside drawcord. WAIST 27" 28-30" 31-33" 34-36" 38-40" 42-44" 46-48" 50-52"
WAIST 19" 20-22" 23-25" 26-28" 29-31"